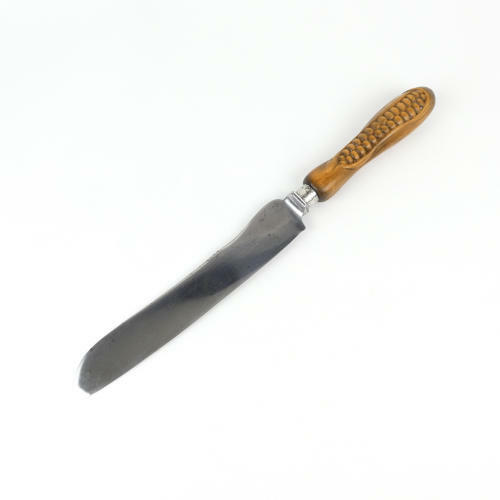 A Victorian steel breadknife with a carved wooden handle. This is quite an unusual design as the handle is carved with a corn on the cob. The steel blade bears a manufacturers mark but this is now quite worn. What remains is a crossed key symbol above ‘**SSONS SHEFFIELD ****AD 1700’. The blade is attached to the handle with a finely embellished white metal collar. The wooden handle is very well carved, with super detail, and the piece dates from c.1860. It is in excellent condition. Dimensions: Length 33cm. Width of blade 3.2 cm. Diameter of handle 2.5cm.